We’d love your help. 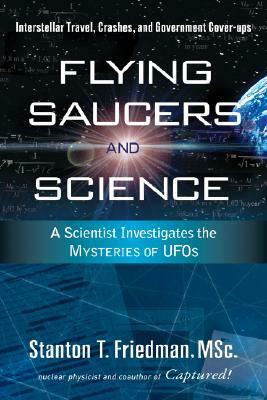 Let us know what’s wrong with this preview of Flying Saucers & Science by Stanton T. Friedman. Flying Saucers & Science: A Scientist Investigates the Mysteries of UFOs: Interstellar Travel, Crashes & Government Cover-ups is a comprehensive look at the scientific data on the UFO phenomenon. Nuclear physicist & lecturer Stanton T. Friedman has distilled over 40 years of research, sharing his work on a variety of classified advanced nuclear & space syst Flying Saucers & Science: A Scientist Investigates the Mysteries of UFOs: Interstellar Travel, Crashes & Government Cover-ups is a comprehensive look at the scientific data on the UFO phenomenon. Nuclear physicist & lecturer Stanton T. Friedman has distilled over 40 years of research, sharing his work on a variety of classified advanced nuclear & space systems. He answers relevant physics questions in lay terms, establishing that travel to nearby stars is possible without violating physical laws. Photographs of advanced propulsion systems, on some of which he worked, are included. He also presents data demonstrating the human ability to withstand high accelerations. He shows that government policy on this subject has been to provide false claims & disinformation, a kind of cosmic Watergate. Flying Saucers & Science presents data from large-scale scientific UFO studies few have detailed. It deals with cover-ups as well as reasons for aliens to visit Earth without landing on the White House lawn. He criticizes the SETI program & details the antipathy of some sf writers to UFOs. False notions about those who believe in the reality of alien visitors & the adequacy of coverage by journalistic & scientific communities are reviewed. The book reveals what technologies might allow interstellar travel, where aliens may originate, why they visit & why governments may cover them up. Readers will never feel the same about UFOs again. To ask other readers questions about Flying Saucers & Science, please sign up. A little repetitive, but this guy's a nuclear physicist that worked on government top secret projects during the Cold War. He knows how things work, and he did his research quite well. He puts out many interesting ideas regarding UFO's. Amazing, interesting and a book I think all should read. Ever wonder what is really going on? you just may find out. This book is interesting in parts. The sections pertaining to MJ-12, Dr. Stanton Friedman's hypotheses about "them," and discussions of nuclear physics and the evolution of propulsion are all fascinating. If this book were just those things, it'd be amazing! Unfortunately, there are a great deal of pages devoted to take-downs of popular debunkers, which gets repetitive after a while. It's interesting to see a take-down of one or two of what Friedman refers to as "noisy negativists," but this book This book is interesting in parts. The sections pertaining to MJ-12, Dr. Stanton Friedman's hypotheses about "them," and discussions of nuclear physics and the evolution of propulsion are all fascinating. If this book were just those things, it'd be amazing! A difficult topic to discuss in a few words, so I won't try. But...he has obviously researched every topic mentioned in this book thoroughly! I trust this man's opinions. The book held my attention. If you're interested in an author who intelligently defends the thesis that some UFOs are extraterrestrial spacecraft, Friedman is worth checking out, both his books and his numerous posted interviews and lectures. Similarly, if you're looking for extensive treatments of the Roswell incidents of 1947 or the Majestic 12 documents, his books on these topics may be the most detailed. Besides all this, he comes across as rather charming and often funny. This one of his books, however, does not deliv If you're interested in an author who intelligently defends the thesis that some UFOs are extraterrestrial spacecraft, Friedman is worth checking out, both his books and his numerous posted interviews and lectures. Similarly, if you're looking for extensive treatments of the Roswell incidents of 1947 or the Majestic 12 documents, his books on these topics may be the most detailed. Besides all this, he comes across as rather charming and often funny. This one of his books, however, does not deliver what its title promises. There is some consideration of practicalities of interstellar travel, yes, but most of the text seems to be a patchwork of lectures on a variety of topics related to UFOs. Some are standalone, but others, such as those on Roswell and MJ12, presume some background on the part of the reader. As a result, there is a great deal of redundancy from chapter to chapter, indicative of the lack of an editor. This book is interesting when it discusses actual UFO sightings and events. It gets a little bogged down trying to trace the mistakes and tricks in trying to demonstrate the lies and inaccuracies in the letters and affidavits issued by the government, the military, and UFO debunkers. Stanton T. Friedman received BSc and MSc degrees in physics from the University of Chicago in 1955 and 1956. He was employed for 14 years as a nuclear physicist for such companies as GE, GM, Westinghouse, TRW Systems, Aerojet General Nucleonics, and McDonnell Douglas on such advanced, classified, eventually cancelled, projects as nuclear aircraft, fission and fusion rockets, and nuclear powerplant Stanton T. Friedman received BSc and MSc degrees in physics from the University of Chicago in 1955 and 1956. He was employed for 14 years as a nuclear physicist for such companies as GE, GM, Westinghouse, TRW Systems, Aerojet General Nucleonics, and McDonnell Douglas on such advanced, classified, eventually cancelled, projects as nuclear aircraft, fission and fusion rockets, and nuclear powerplants for space. Stanton Friedman takes a clear-cut unambiguous stand that SOME UFOs are alien spacecraft, that the subject of flying saucers represents a Cosmic Watergate, that none of the anti-UFO arguments made by a variety of noisy negativists stand up to careful scrutiny, and that we are dealing with the biggest story of the past millennium: visits to Planet Earth by alien spacecraft and the successful coverup by governments of the best data: alien wreckage and bodies recovered in New Mexico, for 59 years. He has spent many weeks at a total of 20 document archives. Stan has successfully taken on many critics of flying saucers, Roswell, Majestic 12, including winning a debate at Oxford University.